The BBC has recruited the unlikely pairing of Huw Edwards and Damon Albarn to help meet the “unique challenge” of covering this summer’s Beijing Olympics as it attempts to walk an editorial tightrope between news and sport. As it geared up for the logistics of transmitting live round-the-clock coverage for 17 days from August 8, the BBC said the decision to send Edwards, the anchor of the 10 o’clock news, reflected the importance of the games as a political and cultural event. Adrian Chiles is to host the breakfast slot, and Gabby Logan will front the prime-time highlights. “There are always going to be news stories from a games, but there will be more than normal [here],” said Logan. Forget Andy Murray, who was watched by a mere 10.5 million viewers on BBC on Monday night. 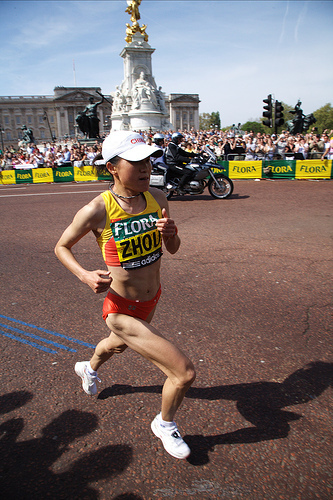 The remarkable Jie Zheng was watched by an estimated television audience of over 100 million in China yesterday as she became the first woman from that vast country to reach the last four at Wimbledon. The audience in Shanghai alone was 14 million. Zheng, ranked 133 in the world having been No786 at the turn of the century, also became the first wild-card entry to reach the semi-finals here as she beat Nicole Vaidisova, the 18th seed, 6-2, 5-7, 6-1. The most heart-warming piece in this story is that Zheng, who turns 25 on Saturday, will not pocket one penny of the £187,500 in prize money she is guaranteed so far. 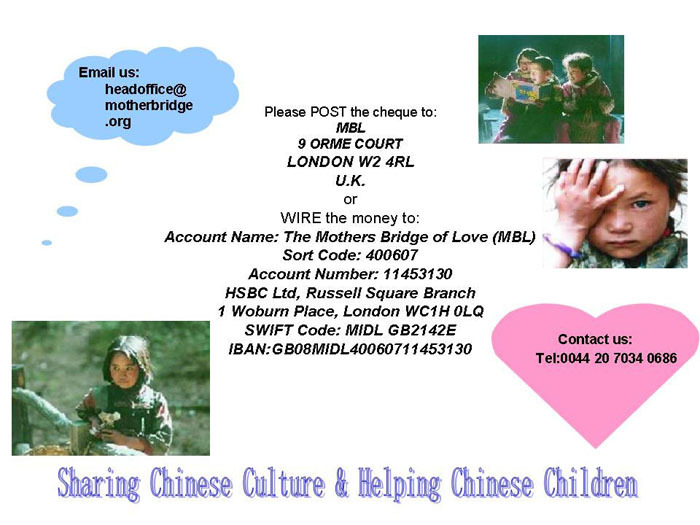 She will donate her winnings to the fund set up following the earthquake in the Sichuan Province in south-west China in May which killed 60,000 people and left five million homeless. Aleksandr Zverev sheltered for three weeks in caves after being flung from his raft in the Chinese wilderness. By night he covered himself with leaves and branches to ward off frostbite. By day he drank river water and hoped for a miracle. He went without food for 25 days. What started as the adventure holiday of a lifetime, shooting the rapids of one of the fastest-flowing and most dangerous rivers in western China, was ending in tragedy. Mr Zverev believed that the river, which swells for only two months a year, had claimed the lives of his five companions. The remote Taklamakan Desert — its name means “you go in but you don’t come out” — was threatening to do the same to him. 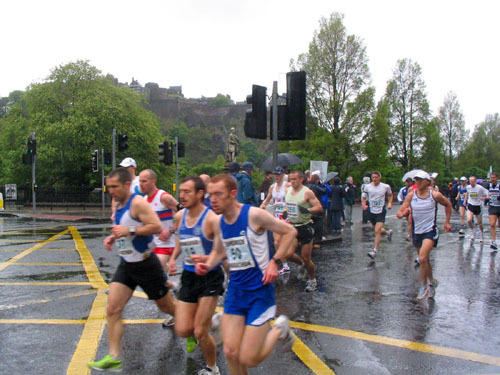 The four relay teams running the Edinburgh Marathon Relay 2007 for the charity Mother’s Bridge of Love (MBL) have successfully finished the Marathon Relay, within 3hrs 30min. to 4hrs. 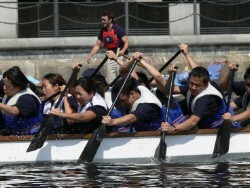 Here are some photos taken by the volunteers supporting the four teams. 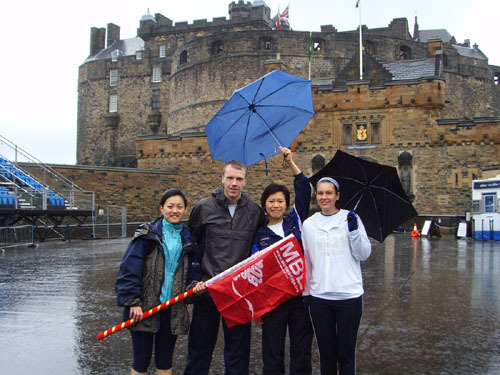 Four teams will run Edinburgh Marathon Relay tomorrow (27 May) for the London based charity Mother’s Bridge of Love (MBL). 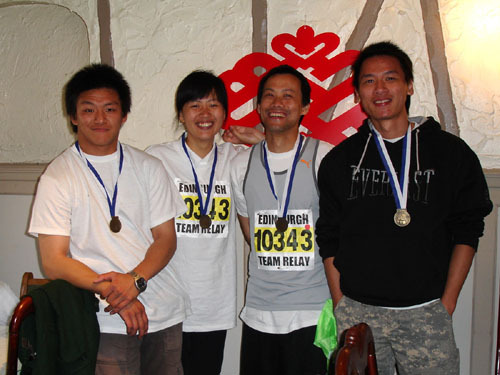 The relay teams, named as The Golden Team, Red Army, Great Wall, and Flying Panda, are formed by runners from Edinburgh, Glasgow, London and Birmingham, of all nationalities. 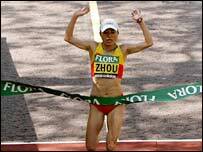 The four runners of every team will each run about 4.2 to 8.5 miles. 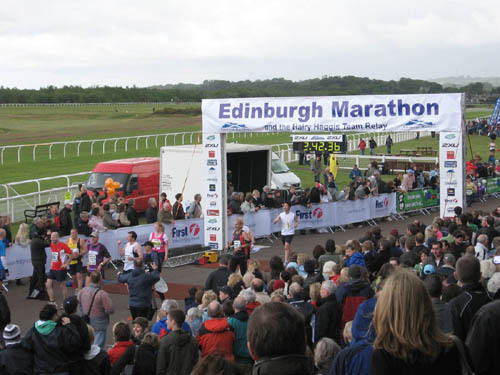 The race will start from Prince Street, under the famous Edinburgh Castle, and finish at Musselburgh Racecourse. 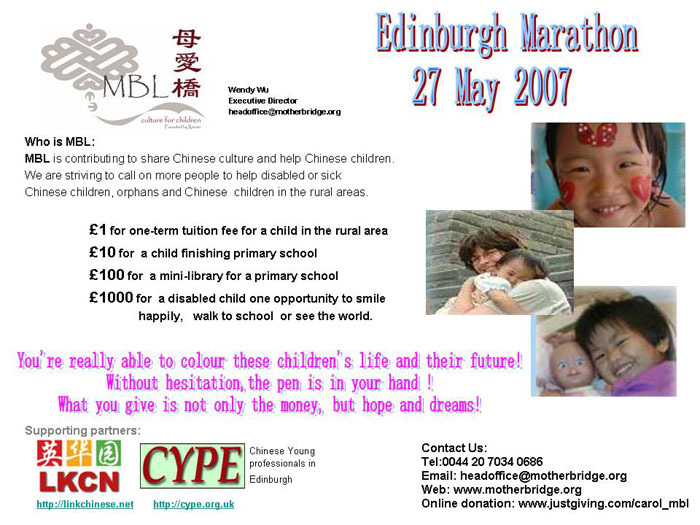 Wendy Wu, the executive director of Mother’s Bridge of Love, praises the runners’ and supporters’ involvement is the prove of, “the power in uniting passion, resources and energy to support our Chinese children who have been abandoned, who have suffered from health, who have never had a chance to touch a book. 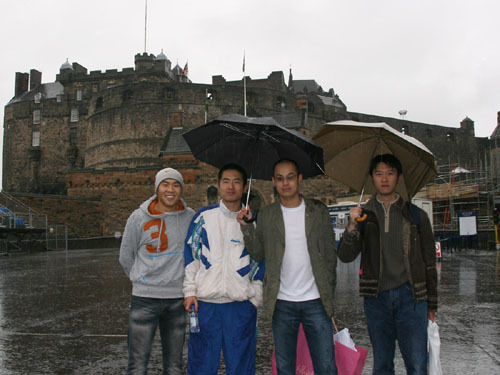 LinkChinese UK, an community of Chinese students, professionals and young generation of migrants, are running a live reporting of the progress of the four teams. 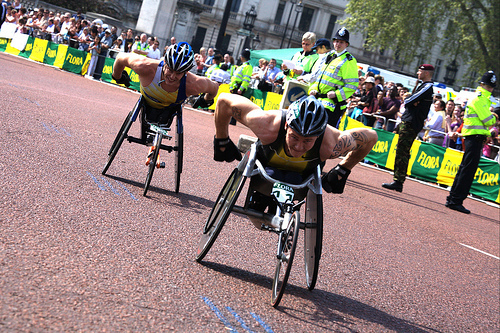 Supporters on the ground will use text message to update a live blog of MBL’s Edinburgh Marathon Relay runners.